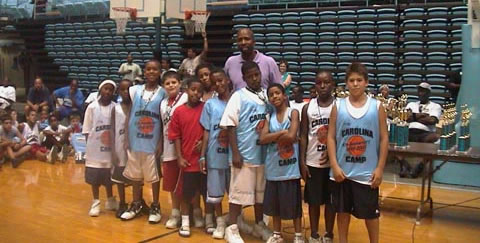 Located at UNC Chapel Hill, the Dean E. Smith Center, The Kenny Smith Carolina Basketball Camp is a top basketball camp with a first-rate facility in which to fine-tune your camper’s game. The day camp provides your child with the opportunity to make new friends, develop his character, and learn valuable life skills. Offering the same resources and activities as the resident camp, the day camp is a less expensive alternative to the resident camp, and a great option for younger campers who are not yet ready for the overnight camp experience. Our North Carolina basketball camp provides lunch for all of our day campers, beginning with the first day of camp through their final day. Parents are required to drop off and pick up your campers on time every day from the Smith Center. Tue., July 23, 2019. Time: 8:00am – 12:00pm.